Well I am nearing the end of my Ravelry Knitting Olympics. I was on 2 different teams. Team WIPS2010 with 2 projects for WPIS Dancing. Sadly I will not medal in this event with either project. However For Team Tardis I have medaled in 4 events with a total of 5 projects! I have 3 entries in this event for frogging old projects. The first is an old unknown garter stitch thing. I have no idea what it was supposed to be so it clearly had to get frogged. 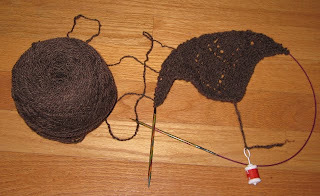 The second project to frog was my Brown Dragon Shawl. After I discovered I was twisting stitches in one section and knit the same row twice elsewhere it was clear I had to start over. I frogged it without remorse and decided I need to find a better way to keep the pattern in front of me when I restart this project. Last was Growler Cozy Rev 2. The bottom section did not felt at all so I had to rip it back and try to pick up from fulled stitches. Another event I entered was Flying Camel Spin. 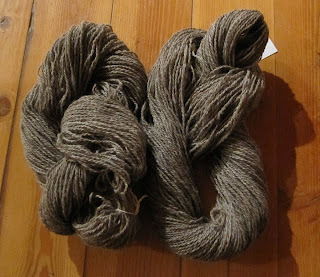 I had a bunch of roving from our sheep Brownie from 2006. This was her last fleece and I really wanted to spin it all up. I managed to get most of it done, 470 yards worth for my entry. The final 2 events I entered were the Designer Pattern Skeleton and the Felting freestyle with my modified Growler Cozy Pattern. I managed to get them done in just 2 days! 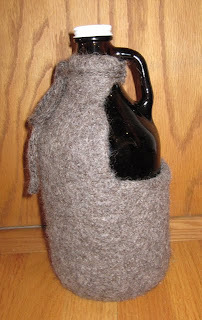 Growler Cozy Pattern – Sized to fit a US Standard 64 ounce glass growler. I used a very soft 24 WPI 2 ply that felts well and size 10 or 6mm needles. You need a circular or 2 and some DPNs and a tapestry needle. After fulling 4 inches high 4 3/4 inches wide between borders. If your yarn fulls differently then you may need to adjust the number of stitches for your growler cozy. Continue alternating P and K rows until this section is 3.5 inches long. 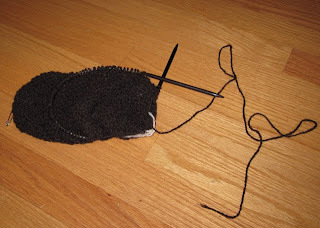 Continue to knit in the round until the body is 11-11.5 inches long or so. Just keep doing that all around switching to double points as required and moving the marker as required or remove marker entirely until you have 4 or 5 stitches left. Thread the yarn through the last 4 or 5 stitches and weave in all the ends. Make 2 I-Cord strings each about 15 inches long leaving a 10 inch tail on the cast off end. 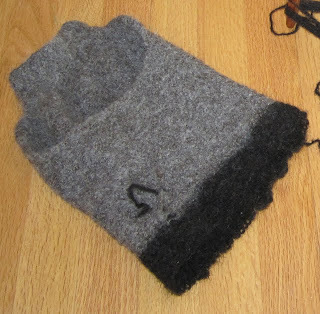 Using a tapestry needle take the long tail and pull the I-Cord through the top edge of the cozy. It’s easiest to do this before felting but it can be done later. Take care not to cut the yarns. Sew the end back to the I-Cord using the tail end of yarn. Doing it this way means you can replace the cord when it gets worn or breaks. Full the fabric until it fits the growler. Stretch over a growler while wet and pin the top together with a safety pen. Once it has dried you can use the ties to tie up the top.